The South Korean constitutional court has removed the President of South Korea from office on Friday. This was done after a graft scandal was discovered that involved the countries conglomerates. This has even sparked protests from her supporters where it is said that some protesters were killed while in clashes with police officers. The President Park Gun-hye is actually the first democratically elected official to be forced to be removed from office. 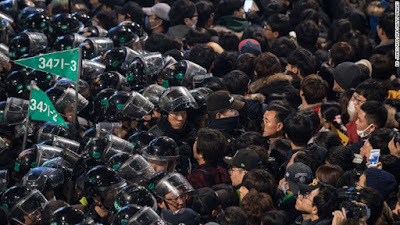 The supporters of Park decided to try and break through the police barricades after they heard of the verdict that they of course did not enjoy. Sadly within all of that commotion this is where the some people died. However a poll showed that 70% of her conservative supporters supported her oust from office. Park can now face criminal charges of many kind such as abuse of power, extortion, bribery and she no longer has immunity. There has also been at least hundreds of thousands of supporters at peaceful protests around the entire country. There will also be a new election that will be held in 60 days. 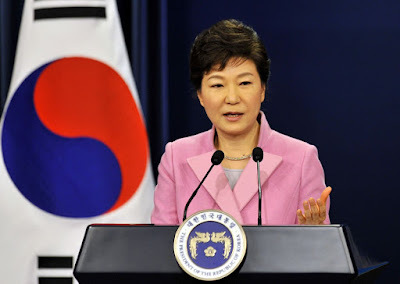 The acting chief judge of the court Lee Jung-mi said that Park had violated the constitutional and the law "throughout her term" and despite the objections of the Parliament and the Press, she had concealed the truth of it all and decided to crack down on the critic of it all. "We remove President Park Geun-hye from office," Lee told the hearing. This all comes at a time where North Korea is a large threat to South Korea as well as North Korea keeps advancing its missile programme and often threatens war with other nations. The Seoul market rose as well as the market currency after the verdict was announced. "The hope is that this will allow the country to have a new leader that can address long-standing challenges such as labour market reforms and escalated geopolitical tensions," said Trinh Nguyen. Park will be leaving the presidential compound for the second time in her life. The first time she left was with her siblings when her mother was sadly killed by a bullet that was meant to be for her father. This happened in 1979. This time however it is a little different because she is very likely to be investigated and worse comes to worse she ends up in jail. Well, the U.S did have Sean Spicer who is a spokesperson speak about this topic. He basically said that it is not a international issue and is a domestic issue that the U.S does not plan to interfere with. The United States also does not want to get involved with something as delicate as this since there is a lot at stake. The missile defense program that is going on between Seoul and Washington is also going to continue. It is believed that the delivery of defense against missiles from places such as North Korea is a must and will hopefully continue under a new president of the nation.